(Sugar Land, Tex., July 10, 2018) — The Sugar Land Skeeters today announced that the contract of right-hander Dallas Beeler was purchased by the Kansas City Royals, who’ve assigned Beeler to Double-A North Arkansas. 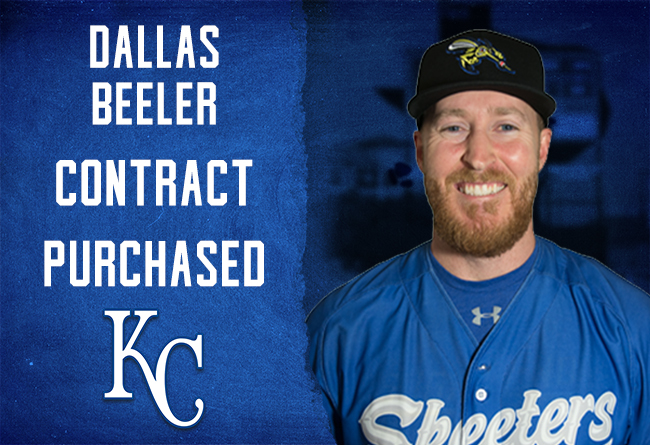 Beeler, 29, becomes the ninth player from the 2018 Skeeters to have his contract purchased by a Major League organization, which leads the Atlantic League. The nine contracts purchased from Major League organizations also matches the franchise record originally set in 2013. Since the Skeeters joined the Atlantic League in 2012, the most contracts purchased by Major League organizations was 13 from the Somerset Patriots in 2017. Beeler has spent all seven of his seasons at the affiliated level with the Cubs and last appeared at the affiliated level in 2016 with Triple-A Iowa. He missed a majority of the 2016 season and all of the 2017 season after undergoing flexor tendon surgery and ulnar nerve transposition surgery. Through 115 career appearances (99 starts) at the affiliated level, Beeler has gone 31-29 with a 3.68 ERA, striking out 360 batters to 151 walks over 547 2/3 innings pitched. The Skeeters return to Constellation Field on Friday, July 13, to begin a seven-game series against the Road Warriors as fans can enjoy our Friday Fireworks post-game show to open the series. The first 2,000 fans in attendance on Saturday, July 14, will receive our Snow Globe Giveaway (courtesy of Sugar Land Holiday Lights) and can enjoy many in-game promotions for our Christmas in July, including a post-game jersey auction of our Christmas-themed uniforms. The weekend will conclude with Sunday Funday, including pregame autographs, pregame catch on the field and kids getting to run the bases after the game.